The question is asked by every newbie computer learner or child presented with keyboard for the first time that why keyboards are in qwerty format, or why keyboards are not in alphabetical order? So why keyboard keys are not in alphabetical order, because the reason dates back to the time of manual typewriters. When the first typewriter was invented, the keys were in alphabetic order, but people used to type so fast that the mechanical arms got tangled up quickly. That’s the reason first time Christopher Sholes in 1872 presented qwerty layout by putting common letters in hard-to-reach spots and keys were randomly positioned to actually slow down typing and prevent the key jams. 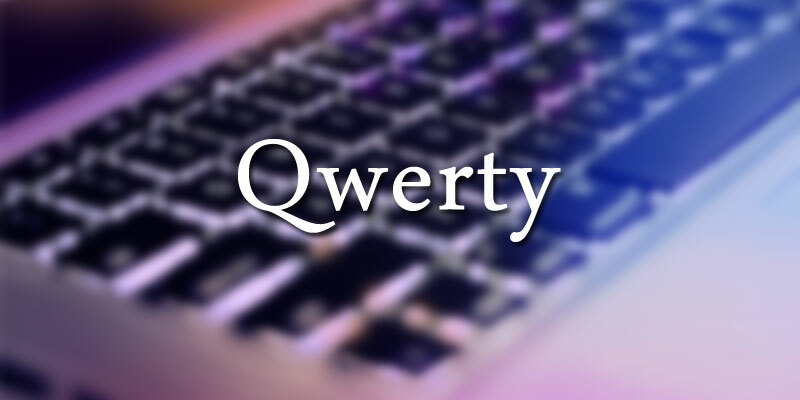 Afterwards this qwerty layout was adapted by everyone and it becomes the standard keyboard layout in typewriters. One prominent attempt was made by Professor August Dvorak of Washington State University in 1930 to replace the tradition qwerty keyboard with a new user-friendly keyboard and finally he redesigned a new keyboard layout called Dvorak in which all of the vowels and the five most commonly used consonants were arranged on the home row (AOEUIDHTNS). Even though the design required a typist to frequently use alternate hands to type most words, with the Dvorak keyboard, a person could type about 400 of the English language’s most common used words just by using the keys of the home row, compared to 100 words on the QWERTY keyboard. In addition, using the Dvorak keyboard, a typist’s fingers would not have to travel as far as they did on Sholes’ keyboard to type the majority of words. Dvorak set out to show his machine superior to Sholes’, but his keyboard never held on much popularity like Sholes’. Numerous studies used to test the efficiency of his keyboard were resulted into imperfect or were believed a conflict of interest since Dvorak conducted them himself. Changing the keyboard format is like proposing to reverse the Ten Commandments and the Golden Rule, discard every moral principle, and ridicule motherhood. This ultimately killed the Dvorak keyboard as the majority of people didn’t want to commit the time or resources it would take to be trained on a new keyboard. Thus, the Qwerty keyboard continued as it is today and apparently will remain same for the future. It didn’t matter which keyboard layout you use. It’s totally on you that how much experienced you are, or it’s based on the your skill rather than any keyboard layout being superior to other in larger sample size data.